This year the final Marlboro Masters is being run two months early, in order to get in before the Dutch ban on tobacco advertising comes into force. Consequently it's a lot colder than everyone is used to, and a rain shower yesterday coupled with strong winds on Friday gave the track a fine coating of sand. This made life slightly difficult for a lot of people; especially it seemed the British F3 International Series runners. It certainly wasn't bothering the F3 Euro Series team, ASM F3, as their drivers were both blindingly fast in the untimed morning sessions. Most people could cope with the fact that Lewis Hamilton was two seconds faster than last year's pole position time, but the fact that his team-mate, Adrian Sutil, was also right up there took some dealing with, because Sutil has never appeared to anything special at all before joining the all-conquering French team. As if the British runners hadn't had enough problems when half of them found that their boots and suits weren't legal and they had to buy new ones to get through scrutineering, there was general alarm at the idea of taking on ASM, especially as these days the race is run using Kumho tyres, the same ones that are used for the Euro Series. The Brits all run Avons, and therefore have to adjust whenever they come here. At Carlin Motorsport, Trevor Carlin was back in action, having walked out on the debacle that Jordan has become. He arrived at the track just in time to see his drivers' go off. Alvaro Parente was up to 3rd, but then skittered off into the gravel and broke the car; some of the suspension parts were knitted into new and interesting shapes, and the result was a lot of frantic activity as the team tried to get him ready to go out again in the second session. They failed, and the team mood wasn't much improved when Christian Bakkerud had a massive off at Scheivlak, spinning and missing the barriers by about an inch. Afterwards he was complaining of a headache, and looked rather shaken. Just for good measure, things weren't a lot better at T-Sport, where Ryan Lewis also missed the second session, having offed it first thing. 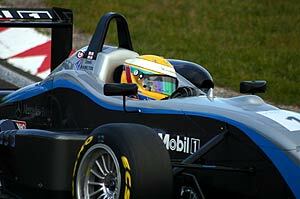 And at Double R Racing, Bruno Senna was confined to the pits with engine problems for half the session, while Ferdinand Kool (technically JB Motorsport, but being run by Promatecme F3, along with Steven Kane) was another to miss out on most of the running, when he was hit by gearbox problems. Thomas Holzer (AM-Holzer Rennsport) was first out on a sandy, messy track. Meanwhile, on his out la, pre-race favourite Hamilton got himself trapped behind Lo?c Duval (Signature-Plus) and he wasn't exactly happy about it; it didn't really matter, but the Englishman clearly wanted his space, and he didn't want to have to wait to get it. Marko Asmer (Hitech Racing) didn't seem to be looking for space at all, and was straight back to the pits before he'd even had a chance to set a time. With his extremely limited budget, the Estonian can't risk crashing, and it showed with every lap he did. With the initial runners setting times in the 1.38s, and last year's pole position a 1.33, it was obviously not representative. With Duval then leapfrogging up to 2nd, and Hamilton setting a 1.33, Ross Zwolsman (Ross Zwolsman) decided to take to the pits early on. It was probably the safest place to be, really. A lap later Hamilton had seriously upped the ante, and was down in the 1.32s. Behind him, di Resta was heading Duval and Neuhauser, but they were soon joined by Kane, who dragged his Lola up to 3rd, thus demoting Duval. Duval got edged out a bit further, but soon grabbed 4th back, while Asmer decided it was time to join the frame. He was immediately up to 10th, immediately behind Daniel Clarke (Double R Racing) and Bakkerud. Bakkerud's teammate, Charlie Kimball, was running last of all, although he seemed to suddenly wake up as the tyres came in. With Hamilton over a second faster, and speeding up with every lap, it was all about 2nd place really. Kimball seemed to think he might like a piece of that, and a clear lap saw him grab 4th place, with the usual suspects (Hamilton, di Resta and Duval) just ahead of him. Kane was fifth, from Clarke, Kool, Marco Bonanomi (Prema Powerteam), Neuhauser, Bakkerud and Stephen Jelley (Menu Motorsport). A lap later and the American was a place further up, with Kohei Hirate (Team Rosberg) barging his way into 4th. The scrap was a long way from over, as Kane proved by promptly pushing Kimball back down to 3rd. Elsewhere, Bonanomi was now 7th, while Neuhauser was pushing for places again, and was 4th. Hamilton's progress at the front was nothing short of majestic, with the Euro Series favourite repeatedly improving on his time, and no one apparently able to get within shouting distance of the youngster. Kane was giving it his best shot, though, and once more the Northern Irish youngster moved back up to 3rd. He was certainly in far better shape than James Walker (Fortec Motorsport), the Englishman a dismal 12th, and not looking like he was going to improve his position any time soon. Neuhauser, on the other hand, was fighting Bonanomi for 2nd, while all the other runners started frantically swapping places. Atila Abreu (ASL-Mücke Motorsport) was now 9th, which was the first sign of life from the Brazilian, and pretty much the last. Bakkerud, on the other hand, was 6th now, which was a very good effort from the youngster on his F3 debut here. With around half the session still to run, the order now was Hamilton, Bonanomi, Neuhauser, di Resta, Kane, Bakkerud, Kimball, Hirate, Duval and Walker. The excitement still wasn't over though, with Kane now on the hunt for Hamilton, edging ever closer to the ASM driver's time. He's finally joined Hamilton as the only other man in the 1.32s, and it was beginning to look as if an upset might be on the cards. However, there was still Neuhauser and Bonanomi to account for, as they'd now joined the 1.32 club. Not far behind them Kimball and Bakkerud were trading times for 6th, until Hirate thought he might like to join in too. And then came the big surprise. Kane was suddenly at the top of the times, almost a quarter of a second ahead of Hamilton. Maybe, just maybe, ASM weren't invincible after all! The long-running Hitech/Fortec battle was also being waged, with Walker and Asmer fighting for roughly the same places, with Walker getting the upper hand at this point. At the front, Kane was able to set an even quicker time, and was now almost half a second ahead. At least in selecting his as one of their three drivers, Marlboro had not thrown their money away. It remained to be seen whether Hamilton could answer the challenge or not. It seemed he could. A lap in the 1.31s meant that the ASM man was back on top of the order again. Could anyone find the answer? Probably not, by the look of things. He was half a second ahead now and was never challenged again. Meanwhile, Neuhauser was 4th, but the next thing he knew Bonanomi had come back at him and was again 4th. Di Resta was 5th, and Asmer had displaced Kimball for 7th. Hamilton had already given up flogging round and wearing out his tyres, and was back in the pits by the time the chequered flag was brought out to end the session. Asmer rocketed into 6th on his final lap, and di Resta grabbed 3rd as he crossed the line. The final improvement of the session came from Jelley, through it only moved him up to 15th. He had been last, so it was some sort of improvement. And so, for the odd numbers, the order was Hamilton, Kane, di Resta, Bonanomi, Neuhauser, Asmer, Walker, Kimball, Hirate, Bakkerud, Abreu, Clarke, Duval, Zwolsman, Jelley, Kool, Holzer, Ronayne O'Mahony (Fortec Motorsport) and Nico Verdonck (Team Midland Euroseries). And so, a few minutes later, the even numbered cars went out to play. In the usual Carlin manner, Parente stayed in the pit lane till everyone else had gone, and then ventured onto the track. Hamilton's team-mate, Adrian Sutil, promptly managed to spin on his out lap, which made you wonder what advice Lewis had given him between sessions. The first of the sensible times this time out came from Lucas di Grassi (Manor Motorsport), hitting the 1.34s early on. The great hope of Chinese motorsport, Ho Pin Tung (Alan Docking Racing pretending to be JB Motorsport), was 2nd, but the next thing Mike Conway (Fortec Motorsport) was right up there, showing an unexpected turn of speed given his performance in the morning. Despite his grassy moment, Sutil was an early 2nd, with di Grassi and Tung now 3rd and 4th. They were soon joined by Greg Franchi (Prema Powerteam), who shot up to 3rd, and Alejandro Nunez (HBR Motorsport) who was now a somewhat surprising 5th. Even without yellow flags to help him, James Rossiter (Signature-Plus) was now 4th, but the order kept shifting, and Sutil was soon ahead of the pack, though slower than Hamilton. And the Parente started to show, hitting 3rd, while behind him Nunez and Rossiter were swapping places, only to both be shunted further down by Giedo van der Garde (Team Rosberg). He was demoted in his turn by Esteban Guerreri (Team Midland Euro Series). Parente, meanwhile, was speeding up, and was now 2nd. This seemed to be a much more evenly matched session that the odd numbers, with Ryan Lewis now edging up to 7th, while Conway again found some speed to go 2nd again. Franck Perera (Prema Powerteam) decided to join in, snatching a provisional 5th, though he would probably end up even further ahead before he was done. It was getting interesting out there. Parente was still pushing ahead, and proved it by setting a new fastest lap of the session, and he continued to circulate round while almost everyone else was in the pits, having tweaks administered and new tyres fitted. It was probably a good idea, but in the long run it proved counter-productive as he returned to the pits as everyone else re-emerged. Meanwhile, di Grassi was now 12th, and wasn't happy at all. Guillaume Moreau (Signature) was beginning to show, and was now 4th, having been almost last a lap earlier. Di Grassi was also suddenly looking a lot better, and just as Parente stopped at his garage, the Brazilian snatched pole from his fellow Portuguese-speaker. It wasn't a very friendly gesture! Nunez was still trying hard, as was Moreau, who was 3rd. Rossiter was still floundering down in 9th, which is not where you'd expect to find him, and Sutil was paying the price for his turn of speed with a series of very wobbly moments. The other Spaniard in this event, Alvaro Barba (Hitech Racing), was a long way from the front, with a less than stellar performance. Running at the front of the Spanish championship in no way prepares a lad for facing this level of opposition, and he looked rather shell-shocked as a consequence. He didn't look quite as shocked as Senna, the Brazilian being plagued by engine problems all morning. Judging by the way things were going, he was still suffering from Mugen malaise, and was running last but one, just ahead of Keiko Ihara (Carlin Motorsport). As the Japanese woman was about 6 seconds off the pace, this was really nothing to be proud of. Local hero van der Garde was still showing well, and was now 4th, while Sutil was 2nd, not that far shy of di Grassi's provisional pole, but there was still quite a long way to go. With Nunez seeming to be getting the hang of it now, slotting in to 9th, while Rossiter was now 8th and Moreau was 3rd. While all this was going on, Barba dragged himself into the top ten, and the fight for 3rd went on, with van der Garde snatching it back only to lose it to Conway, who then promptly lost it to van der Garde again as the session drew to a close. At the pointy end, Sutil was now 0.03 seconds off di Grassi's pace, and was beginning to look very menacing indeed. Meanwhile, Guerreri was back in some sort of contention and had landed 9th, while Sebastian Vettel (ASL-Mücke Motorsport) was 7th. Senna and Lewis were bust fighting over the last-but-one place, until Lewis managed to find some hitherto unexpected speed from somewhere, finishing the session 12th, though it has to be said he did it under yellow flags, caused when Vettel - who had just gone even faster for 6th - made a slight nonsense of it all and ended up in the gravel. By the time he finished rotating he was half in and half out of the gravel trap, with his car in a very dangerous position. In a dramatic lap, Sutil snatched pole from his team-mate Hamilton, with a remarkable time of 1.31.4413, a couple of seconds faster than last year's pole time! It was remarkable stuff, though there was a strong suspicion that Hamilton would be quick to remedy the situation in the later qualifying session. One of these days he's going to come a cropper doing something like that, but that clearly hasn't occurred to him yet. Anyway it all became academic when the officials wheeled the red flags out and finished the session half a minute ahead of time. And so, the order in this session was Sutil, di Grassi, van der Garde, Conway, Perera, Vettel, Moreau, Franchi, Parente, Tung, Nunez, Lewis, Guerreri, Rossiter, Barba, Senna and Ihara. Free Practice 1 odd No. Free Practice 1 even No. Free Practice 2 odd No. Free Practice 2 even No.